No recent issue has gripped Brooklyn Heights more than the upcoming reconstruction of the Brooklyn-Queens Expressway. The city’s favored plan would temporarily replace the beloved Heights Promenade with a temporary six-lane bypass. This would bring the truck-clogged interstate, with its noise and pollution, to neighborhood street level for six to eight years. The Brooklyn Heights Association has come up with an alternate proposal that would spare the Promenade. Dubbed the “Parallel Highway,” the plan was designed by Heights-based Marc Wouters Studios. It would move traffic to a temporary two-level structure west of the existing triple cantilever underpinning the Promenade, rather than atop the popular walkway. NYC Department of Transportation is examining the plan and says it is one of several alternatives under consideration. Marc Wouters, an award-winning architect, urban planner and Brooklyn Heights resident, spoke to the Brooklyn Eagle on Tuesday about the project. Wouters, an architect by training, has been an urban planner for years, with a focus on issues of resilience. He worked in Coney Island on post-Superstorm Sandy flooding problems and spent time last year in Puerto Rico after Hurricane Maria, where he continues to be involved. 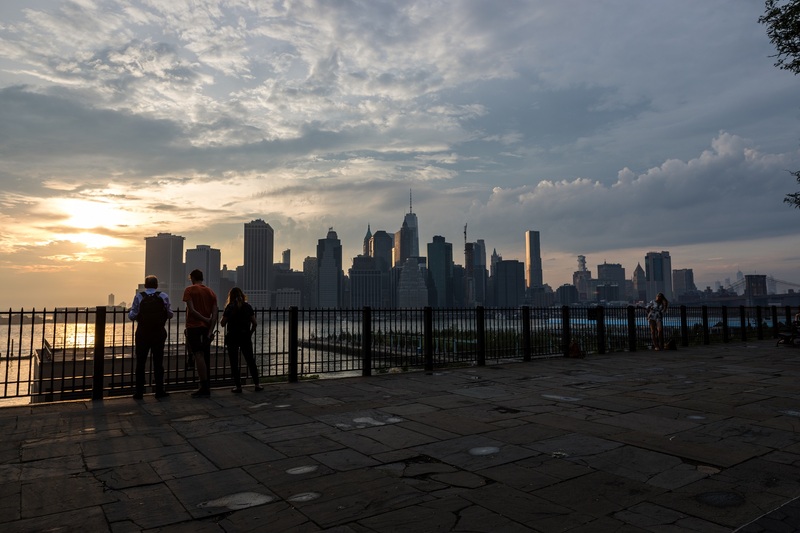 Wouters confronted the BQE problem more than a year ago, when he started looking into ways to make better pedestrian connections across the interstate to the Promenade, Atlantic Avenue, Old Fulton Street or Brooklyn Bridge Park. After the city announced its plan to replace the Promenade with the bypass, BHA began working with Wouters and other experts to develop a better solution. While he’s worked with other communities on similar challenges, this is the first time he’s had to face such a tough one in his own neighborhood, Wouters said. Wouters has worked pro bono much of the time spent on the project. What makes this BQE design better than DOT’s? Wouters outlined the advantages the Parallel Highway offers over DOT’s Promenade plan. “We have two incredible public spaces — the Promenade and Brooklyn Bridge Park — all visited by hundreds of thousands of people from all over the world each year. And there’s playgrounds here also,” Wouters said. “What was also important for us was to come up with a plan that worked for all the communities along this stretch, from Cobble Hill all the way up to DUMBO,” he said. “We can’t create traffic backups in one community just to make it better for another community. The bypass is designed to allow the BQE to remain operational throughout the construction period. “You could use areas under our bypass as staging areas. Also portions of it could be used for parking for Brooklyn Bridge Park,” he said. The city-owned Brooklyn Bridge Park Corporation, which operates and oversees the park, told the Brooklyn Heights Press on Wednesday, “We will be working very closely with the city on any aspects of this plan that will impact the Park.” In the meantime, work on a new parking lot at the eastern edge of the park continues. Wouters doesn’t know how much the project will cost — and doesn’t have the level of insight into traffic patterns and other information DOT is able to leverage. He remains hopeful, however, that DOT will give it a full and fair examination, and is heartened by the agency’s statements that it is not only considering the BHA’s plan but others, as well. “What I’ve always heard is [DOT] Commissioner [Polly] Trottenberg is a good commissioner who cares about neighborhoods. Programs like Vision Zero are very innovative,” he said. “And so I’m very hopeful that, with the announcement that they’re not only looking at our plan, I’m still optimistic that a better outcome will occur. What happens to Furman Street in this plan?